From Funkwerks in Fort Collins Colorado comes their “Ten Quadruple Ale”. The beer pours a chestnut brown with a small tan head. The aroma consists of brown sugar, dark fruits but not much else to speak of. The flavour is of brown sugar, treacle, nuts, dark fruits, strawberries and alcohol. The alcohol content comes in at 10%. While it may not hold up to the best of the style from Belgium this is a really tasty beer and I will be purchasing more now that it is available in Canada. Commercial Description: Inspired by the Dark Strong beers of Belgium, this full-bodied Quadruple Belgian-style ale pours with a deep burgundy hue and a frothy tan head. The malt-forward aromas of toffee and chocolate compliment the dark fruity aromas of raisins and plums. The aromatic qualities follow through in the flavor and combine with refreshing effervescent carbonation. A dry and balanced finish makes this strong but quaffable beer the perfect way to end a long day! Notes of toffee, chocolate, raisins and plums. 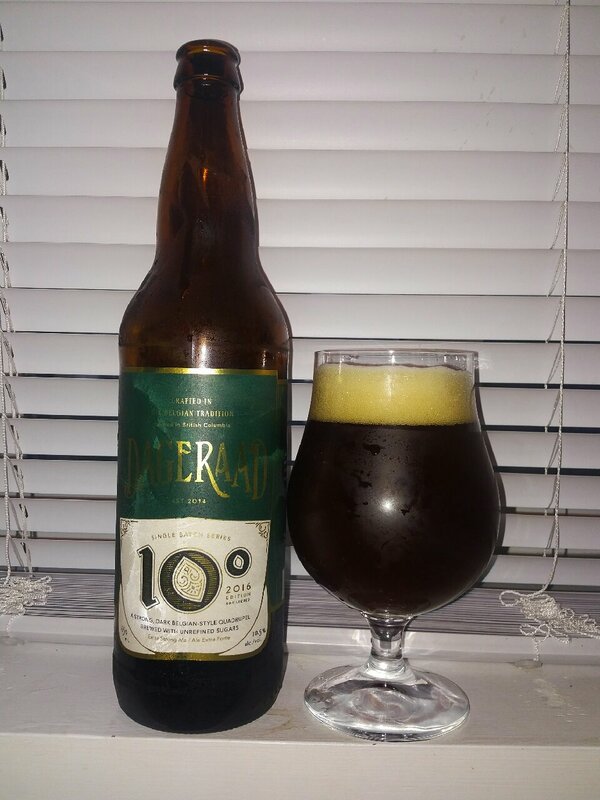 From Dageraad Brewing out of Burnaby BC comes their “10°”a strong, dark Belgian-style quadrupel brewed with unrefined sugars as noted by the Brewery. The beer pours a deep amber with a beige head. The aroma consists of dark fruits, candied sugar, Carmel, malts and spices. 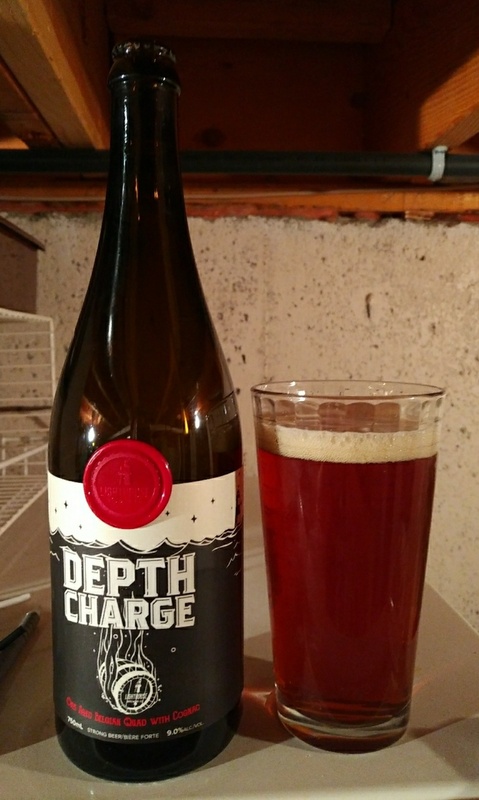 The flavour is of candied sugar, dark fruits, caramel, sweetness, bitterness, earth, spices, yeast and alcohol. The alcohol content comes in at 10.5%. I love a good Belgian Quad and Dageraad is brewing up a tasty one for sure! Make sure to grab a bottle before it’s to late. Commercial Description: Dageraad 10° is our secular homage to the strong, dark ales brewed by Trappist monks in Belgium. The strength of the wort and the addition of exotic, unrefined sugars has tormented the yeast into producing magnificently complex fruit and spice notes to complement the beer’s malty profundity. Its flavour will develop for up to three years in the bottle if properly stored. Dageraad 10° is refermented in the bottle, so pour with care to leave the yeast sediment in the bottle. From Townsite Brewing out of Powell River comes the “Cardena Quad (Barrel Aged)”. The beer pours a chestnut brown with a brown head. The aroma consists of dark fruits, brown sugar, toffee, bubble gum and sweetness. The flavour is of oak, bourbon, dark fruits, brown sugar, toffee, molasses, bubblegum, leather and a sweet finish. The alcohol content comes in at 10.5% with an IBU of 30. With Townsite Brewing having a Belgian brewmaster it is no surprise that they can make a great Quad especially when it is Barrel Aged.